So-Young is still pleading to the Manufacturing Department Guy and she is about to be chased out when Director Baek enters. So-Young bravely asks for her permission to use the sewing machine there. After considering it for a brief moment (and weighing her amazement towards So-Young who don’t have to make the pattern for the dress because she remembers it from her modelling hours), she gives her permission and even lets So-Young uses the better machine. So-Young works diligently while running against the time. Director Baek eyes her in amazement as she works to reproduce the lost sample. Luckily, she manages to complete in time and hands it to the team leader before the meeting starts. On her way out, So-Young runs into Seung-Il. She bows and he continues to walk away, but she stops him. So-Young : I’m really sorry for causing you trouble. But President, you said that I’m not even qualified to be responsible. However, I still want to do my best. Again, I’m sorry. After the meeting, the design team is happy because they don’t have to face any difficulties because So-Young manages to find a substitute for the sample. Chief Jang is still curious about how she found a really same dress in a very short time when suddenly..
..he finds the original sample hidden under another sample on the mannequin. Ha, serves you right! Now everyone knows that it’s Chief Jang’s fault and Na-Ra starts to chide him while she is feeling embarrassed, having acted so badly towards So-Young earlier without looking deeper into the problem. That’s why you have to think before you act, lady. Jin-Wook comes into the department in the midst of the heated argument only to find out that So-Young has completed her one-week part time job there. His face falls (he looks like a lost little puppy..aww) and he solemnly picks up her hair band that she leaves on her desk. Ahh…poor Jin-Wook! Seung-Il is looking at the sample interestingly when someone calls him: it’s Yoon-Seo, asking for a dinner along with Hyun-Yi in order to celebrate Children’s Day. He agrees but when he wants to call Hyun-Yi, he hesitates and ends the call. This man has so many things on his mind about his only daughter, apparently. So-Young is sitting alone in the park while counting her pay. Off topic: I never know that soju even exists in cartons, like juice and milk. Oh, maybe I’m left behind in these things. Back to the story, she accidentally comes at the wrong time to pay her rent : Sun-Nam is courting and in lovey-dovey mode with the tailor shop owner (back in Episode 1). So-Young quickly goes away. Sun-Nam quickly runs behind her and apologizes. He starts to tell her to cheer up, find another man, and forget him. Ha. Looks like he thinks that So-Young likes him. I love her expression here, a mix of I-can’t believe-this and you-gotta-be-kidding-me, and she tries to leave, but he gives her some lists of available job vacancies that he thinks suitable for her. Aww. That’s so sweet. And he says, ” They don’t care about your age at all!” He’s such a good friend for our So-Young. She heads home and gets welcomed with emptied plates by her mother and So-Jin. They don’t leave anything for her, thinking that she has eaten outside. They also talks about Sun-Nam, who they think would be the best man for So-Young to get married to because they won’t have to pay for rent anymore. So-Young feels upset and goes into her room. Inside her room, she looks at her family photo, back in the days where her father was still around, and asks, why her father left them and put her in such a miserable life. Chief Jang and Jin-Wook is at their house, talking about the hair band and the long-list of Chief Jang’s girlfriends, while he is trying to use the hair band for his foot (eww). Chief Jang’s words about only a naive girl would use a hair band like that makes Jin-Wook remember So-Young, again. Seung-Il and Yoon-Seo are out for the dinner planned earlier, but without Hyun-Yi. Seung-Il explains that Hyun-Yi is with her grandmother, and Yoon-Seo, who is upset about this, starts to throw tantrums about Seung-Il being too nice to his ex-wife. Then, she realizes her mistake for being too frank and apologizes, making jet lag as her excuse. The next day, Director Baek is a meeting with Seung-Il when she reminds him about So-Young, the one who reproduce the sample and the cape for Jin-Wook. So-Young, who is still at her house, accidentally pulls out some fabrics from her bag and smiles to herself. She chides herself to stop dreaming about being a designer. Just because she holds a sewing machine for a moment or two, doesn’t mean she’s already a designer, she says. Suddenly, the phone rings and it’s for So-Jin : she has been hired as a junior designer at The Style! So-Young doesn’t believe this and makes a call to the company to confirm it. So-Jin pushes her to take the offer and again, changes her identity with So-Jin. So-Young goes to the company, and after a couple times of hesitation, she finally finds herself inside the team leader’s office. She imagines what will it be if she actually tells her about her real age, but she decides against it. Her princess-like team leader wouldn’t be such a saint to accept her lies just like that without chasing her out, so she decides to carry on her role as So-Jin. Everyone welcomes her into the design team, with warmer welcome than before. Na-Ra also apologizes for her bad temper the other day. Just when So-Young starts to feel accepted and appreciated by them, as usual, they start to order her around to do things and buy things for them. She heads out with a smile, realizing that she is no longer a temporary worker there, and looks over proudly at her new pin cushion, a symbol of the design team. On her way out, she meets Jin-Wook, who teases her. But as she walks away, with Jin-Wook still talking about getting along well, she smiles. Cute! After complaining to herself about the huge difference between So-Jin’s face and hers, So-Young hesitantly hands So-Jin’s ID card to the HR department for administration purposes. She quickly heads out and much to her fear, the HR people starts to call her name after he finds her ID picture different from herself. Big trouble! It’s actually Jin-Wook, coming from nowhere to return her hair band. She’s over-imagining about it and starts to scold him for calling her without a reason. Jin-Wook throws away the hair band, but he decides to pick it up, again. Heh. You softie! So-Young quickly returns to her desk and starts searching for the sentence for liars on the net. She shudders after reading it, but Na-Ra comes in with her resume in her hand. Na-Ra eyes So-Young weirdly after she spots the difference between her ID photo and real self. So-Young holds her breath when Na-Ra is saying something about the striking difference, and luckily, she thinks that So-Young undergoes plastic surgery. She comments, ” How come your face is prettier before the surgery?” Others quickly join in and look at her resume with amazement : she even knows French and have skills in belly dance. So-Young smiles sweetly while cussing So-Jin under her breath. So-Young is sent to a department store named Rosemary, and guess who have to give her a ride? 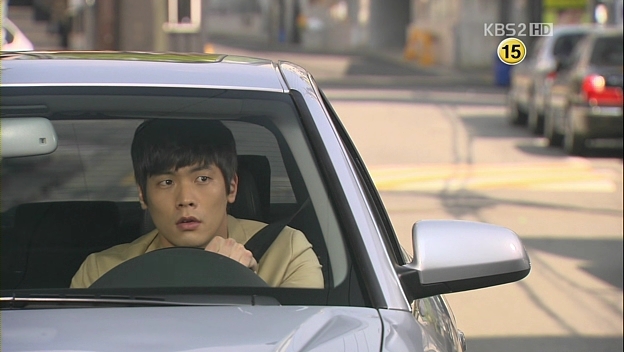 It’s Jin-Wook, with the car he borrowed from Chief Jang. They bicker in the car about the traffic jam and start to accuse each other’s bad luck for the bad traffic. Jin-Wook takes a shortcut and meet with iron bar that block the road, so So-Young is the one who has to push the bar to the roadside. It’s not the best time, but Yoon-Seo suddenly passes by. Jin-Wook sees her and freezes. She drives away and without thinking, he chases after her, leaving So-Young behind. Jin-Wook loses trace of Yoon-Seo, thanks to her outstanding driving and speeding skills and that sends him pondering about the time when Yoon-Seo left him without any word. He drives away and sees a couple who is fighting. The woman’s temper makes him starts to lecture So-Young, only to find that he is alone in the car. Oh. In the meantime, So-Young is fuming while walking to the store. After a good smack on his head (for leaving her and talking behind her back), Jin-Wook tries to get her to ride with him. He get a couple of good smacks on the car before So-Young leaves when the traffic light turns red, leaving him alone on the car. So-Young rides the elevator together with Seung-Il. She looks at him and tries to say her gratitude to him who decides to hire her, but she gets cut by him, who tells her to go and read a Math book. Me don’ get it either..
Yoon-Seo is in his room when Seung-Il enters because she wants to apply as a designer there. Seung-Il praises her good sense of fashion based on her portfolio (and her award and her experience), and judging from this, looks like she gets the position. On that night, Jin-Wook thinks about Yoon-Seo and quickly throws away the thought that she has returned for good. Don’t worry, you’ll see her very soon. The next morning, everyone heads for a break but Na-Ra tells So-Young that a new, young model is coming and So-Young has to teach her the basics. Hum..
It’s Yoon-Seo who comes into the department and So-Young recognizes her from the fake-bag-and-missing-purse incident. Thinking that Yoon-Seo is the new model, So-Young starts acting like Na-Ra, since she is superior than Yoon-Seo right now. Heh, I love her arrogance and when she scolds her for touching the designs on the desk. The design team returns and Chief Jang recognizes Yoon-Seo, their new team leader. So-Young’s face falls, realizing her huge mistake. Yoon-Seo begins to show her power (and partly I think because she wants to show it to So-Young) by criticizing their designs. All of them are not that comfortable to have a very young superior, especially Na-Ra. The winner for the design competition has been announced, and the lucky person is Lee So-Young. So-Young can’t believe her eyes and when she goes to the lobby, the poster there lists her as the grand prize winner. She smiles to herself but quickly realizes that she is not So-Young there; she is So-Jin. And So-Jin calls her. So-Jin tells her that she id the one who sent So-Young’s design to the contest. She only wants the money prize, not the designer post. She says to So-Young,”Besides, you’re already working there as a designer, right?” (I’m starting to hate her~) and tells that she is at the company to collect the prize. So-Young searches for her and finds her. 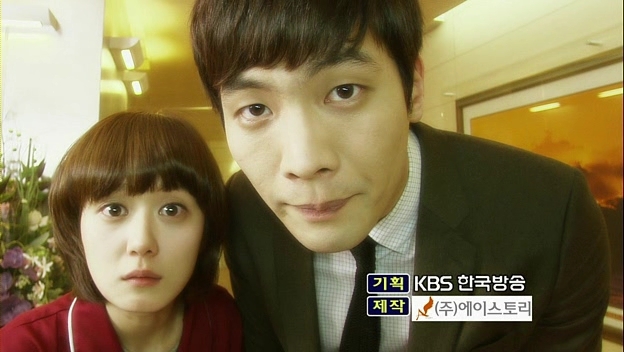 So-Young tries to take back her ID card but So-Jin uses her height as an advantage to hold the card higher. While So-Young is trying to take it, Jin-Wook joins in, thinking that they are playing around and takes the card. So-Young realizes that her identity is in danger right now, and hit his stomach with her head. So-Jin is faster, she gets the fallen card and runs away. So-Young runs after her, but she gets dragged by Jin-Wook, who is curious about what is going on between the two girls. So-Young doesn’t have any other choice and kick his shin. Poor Jin-Wook, but that’s why people said, don’t get in between two fighting girls; you’ll get hurt too! So-Young begins to eavesdrop in front of the President’s office, thinking that So-Jin must have been brought to see him. Suddenly, Seung-Il comes out and she can’t hide herself, so she gives him back his words to her, ” I just want to meet you. Oh, no, that’s not it. I’m going to read a Math book. That’s it.” She scuttles away, with Seung-Il looking behind her. After a fruitless search all over the company for So-Jin, So-Young returns to the Clothing Department, and finds the person that she is frantically searching for before: Yoon-Seo is introducing her to the design team, and So-Jin introduces herself as So-Young. ..and the lies just got a bit more entangled. I like your caps and no one else capping this one right now. Thank you!